The sheer thought of redesigning our kitchen can make our imagination run wild, but there’s nothing wrong with wanting to be adventurous with colours, textures and everything else. There are a few elements within the kitchen however that we often keep basic, purely because their function isn’t entirely that exciting; for example, backsplashes. It isn’t absolutely necessary to have one, but it sure does make cleaning the kitchen easier, but these can be rather dull. 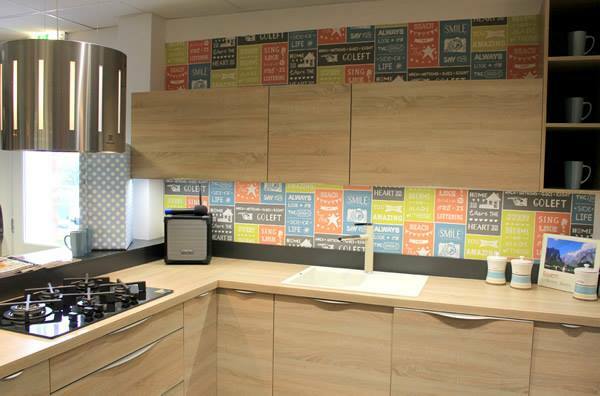 There are a number of showrooms featuring kitchens in North Wales and throughout the UK that you can visit and gather inspiration for your kitchen space. Here you will find ideas on how to decorate, how to utilise the space you have and t also get expert advice. Homeware and D.I.Y stores often have stainless steel plates or discs that you simply hang or sit at the back of your hob space. Alternatively, some ovens come equipped with a glass lid on the hob which lifts up to form a backsplash in an instance. Although handy, these types of backsplashes can be rather dull and don’t contribute anything towards the redesign of your kitchen. Photography – You can get any image you wish blown up to fit either the entire wall that the hob sits against, or to simply fit under the extractor fan. You can use designer work or even a family portrait. You can get sheets of film or glass that protects the image, which then acts as your active backsplash. It’s easy to clean, unique and personal. Chalkboard – This is an inexpensive and simple, yet effective idea. Get yourself a tub of chalkboard paint – enough to cover the area you desire, with enough left over for touch-ups at a later date – and paint the area you want. If you have a small kitchen, it may be best to avoid this idea, or opt for painting a smaller section, as darker colours can make the space look smaller. However for a family home with young kids this is the ideal addition, as kids can draw on the walls without the worry of how you’re going to clean it up. Pennies – Do you have, or know someone who has a whole jar filled with 1p and 2p coins? Well, copper has made its way into the trends for kitchens, as metallic finishes are becoming increasingly popular. If you have a few pennies to spare, then why not give this one a go: place ceramic tile sheets on the areas you want to cover and flue pennies on top to form a glistening, metallic backsplash. Wine Corks – Fear not, this idea will not require you to drink copious amounts of wine just to supply the goods for this project. Once you’ve opened a bottle of wine, put the cork to one side as these will be sliced at a later date. One cork can easily be sliced into three equal pieces which you can then fix to the wall in rows to fit your desired space. The more variation in colour you are able to get, the better. Broken China – We’ve all experienced breaking a plate before, and our instant reaction is to quickly and safely sweep it all up and take it straight to the bin. Instead, save pieces that are of interest; colourful, interesting patterns, or textures etc. and these can be used to form a mosaic of broken ceramics across the wall.